Turricanchat: Every second sunday at 10:00 pm CET at irc.turricanforever.de in the channel #turrican | Next: | What is IRC? More about the challenging level pack here! This page is member of Turrican.eu, following features are presentet by all participating pages: The forum, the soundbase and the levelbase. More to come! > Underearth is a levelpack for T2002. > Beginners should read the Installation tutorial, and get Robert's great T- starter (TM). Metroidican Mission-X is the next coming T2002 level pack by Lukasz Maniewski. Enjoy the screenshots! Turrican2spy allows to have a look at the level maps of the TurricanII Amiga version, including spawn points. It can extract sprite sheets as well. 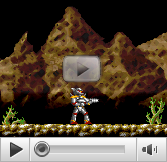 Furthermore I compiled a Turrican intro show of YouTube videos. al size=-1>This site is a member of WebRing.